Hailing from Utah, The Piano Guys became an Internet sensation by way of their immensely successful series of striking self-made music videos; their YouTube channel boasts 1.6 million subscribers. But it’s their highly original blend of classical music with pop that brought them to their major label debut album, The Piano Guys, released on Sony Masterworks in 2012. The album topped Billboard’s New Age and Classical charts. The album features the imaginative mash-up arrangements that The Piano Guys are already famous for, including sources ranging from Michael Jackson to Mozart, The Bourne Identity to David Guetta. It also includes an original song and innovative takes on hits by One Direction, Adele and Christina Perri. The Piano Guys 2is set for release on Sony Masterworks May 7, 2013. But just who are The Piano Guys? Actually, there’s only one piano player, Jon Schmidt, and one other instrumentalist, Steven Sharp Nelson, on cello, and they have played together for twenty years. Yet the other three – Paul Anderson, Tel Stewart and Al van der Beek – are equally significant members of the group. The inventive cinematography of Stewart and Anderson teams with van der Beek’s studio prowess. The Piano Guys have connected quietly but emotionally with a massive audience. 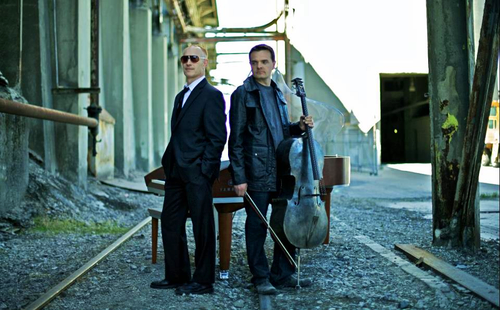 The spectacular Piano Guys videos, which have so far netted over 222 million YouTube views (and 500,000 new views a day), are essentially divined by Stewart and Anderson. And sure enough, The Piano Guys have over 530,000 Facebook fans who have shared videos like “Michael Meets Mozart.” “Michael Meets Mozart” is on The Piano Guys debut CD, as is “Cello Wars,” the ambitious video which resulted from a six-month production required to realize its Star Wars-inspired light saber/cello bow concept, since rewarded by over 12 million YouTube views.